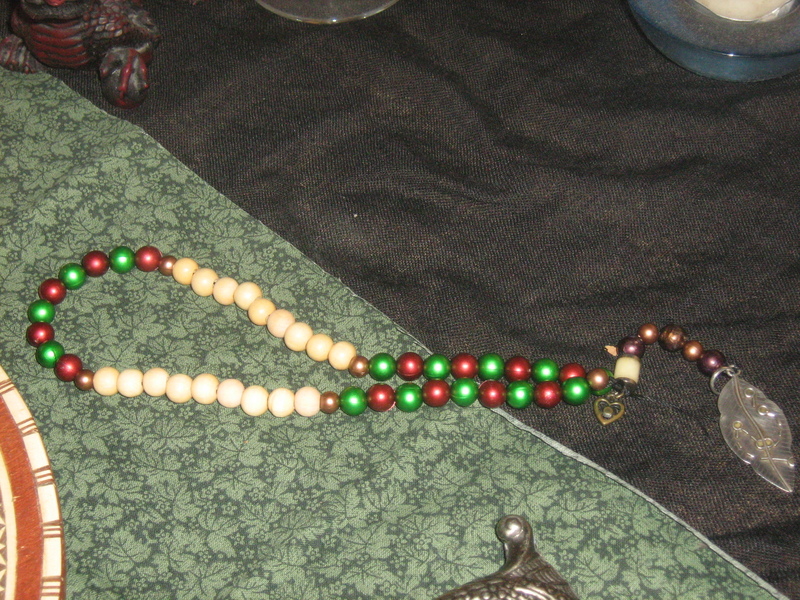 A string of prayer beads for Sobek and Heru-sa-Aset, and also for Nit-Tem-Amun. 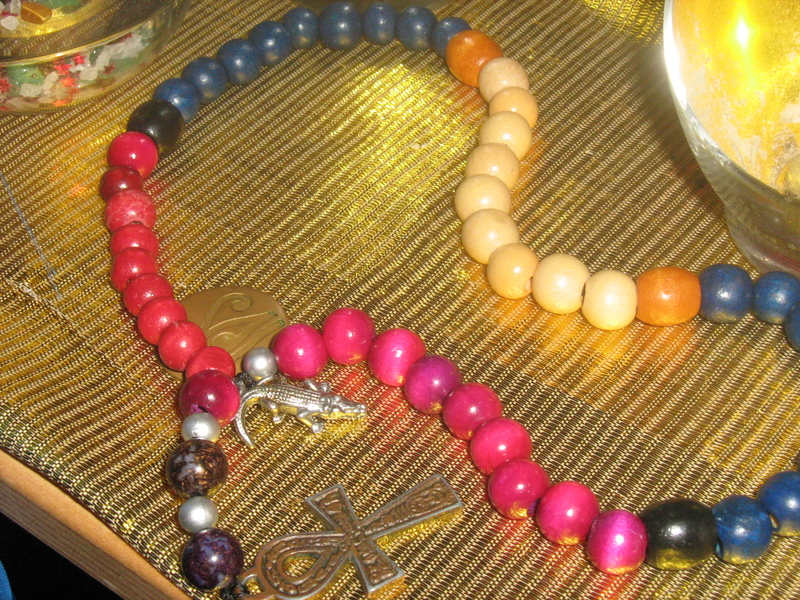 The red beads are for Sobek/Nit, the blue beads are for Tem, and the cream beads are for Amun/Heru-sa-Aset. I redid my old prayer beads last night and rejigged them into something more fitting to my path. The one above was meant to be just for Sobek and Heru-sa-Aset as the Celestial Twins (hence the crocodile and Eye pendants), but I also got nudged that they also belong to Nit-Tem-Amun, too (Don’t worry, there’ll be a Pagan Blog Project post on Them in due course). There’s no particular set of prayers for it, though. I was more considering using them for adorations, or for meditation/quiet shrine time. I actually made two more sets, one for Aset/Isis, and another for the Horned Goddess. I want to make another set for Hekate too, but I need some more red and black beads. All three sets are arranged in groups of nine and then a spacer bead. 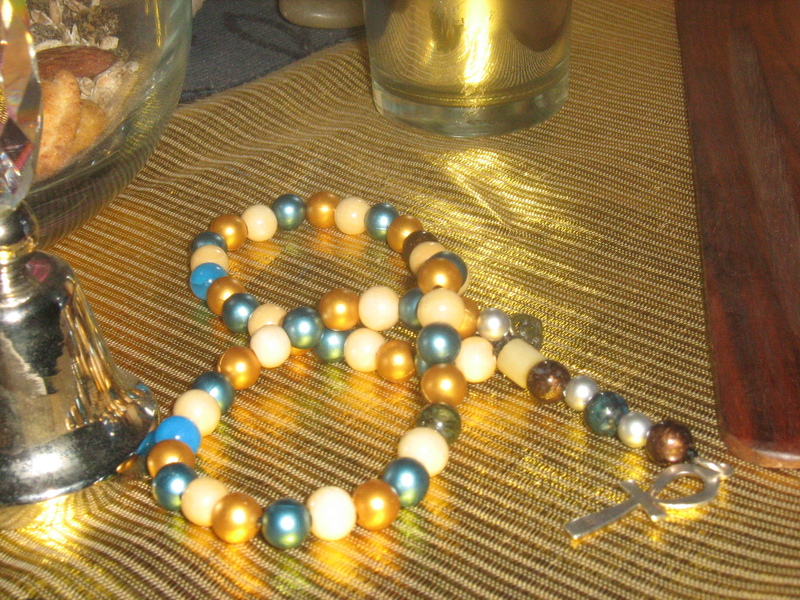 A string of prayer beads for Aset/Isis. It's made of Her colours, moreso than having beads of any particular meaning. This set is for Aset/Isis. This is definitely a set more to use for adorations and chants. There’s no particular order to the colours, apart from the fact that they’re Her colours. It feels really nice to hold, and the beads are small enough to feel like you’re not holding some large string of beads.I have half a mind to chant Aset-Nut/Isis-Hekate on the nine, and say prayers on the four spacers. But IDK. A string of prayer beads for the Horned Goddess. The green is for the forest, the red for the Beltaine fire, and the cream/white for the totality of gender that She represents. This entry was posted in Uncategorized and tagged aset, creator gods, genderqueer gods, getting crafty, hekate, heru-sa-aset, isis, prayer beads, sobek gets his own tag, the horned goddess. Can you tell me more about praying with ankh beads. Is it similar to praying the rosary? Please guide me with any web links or advice. It’s a bit different to the rosary. Some people use the beads to chant the epithets of a god, or adorations to a god, while others write specific prayers that use a specific set of beads for them. I’ve also seen them used as statue decoration. I’ve done any and all of these things from time to time, depending on the beads and the god. I don’t know of any specific resources I could point you at, though, sorry about that. But that’s a short overview of how I’ve seen them used.